As summer is near the drought and water shortage problem, Iranian provinces have experienced over the past years, has started to grow acute, with more and more cities suffering from such problems. An Iranian official has said that more than 500 Iranian cities are struggling with drinking water shortage, an immediate result of low precipitation in Iran. 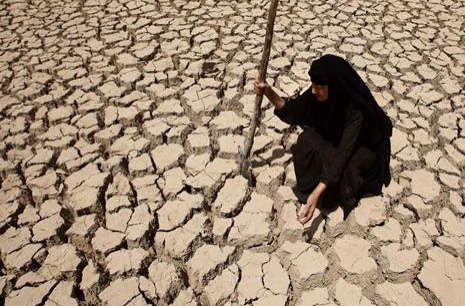 Esmaeil Najjar, a deputy minister of interior and head of Iran Crisis Management Organization noted that over the past two decades, the scourge of drought has struck the country, adding that Iran lies on an “arid belt” on Earth, Press TV reported. The drought in Iran has become one of the most important topics in the country at a time when a range of drastic ecological and environmental problems need to be urgently addressed. Iran’s Energy Ministry earlier announced that about 60 percent of all the reservoirs of major dams are already empty. The ministry said there has been a decrease of 16 percent in the inflow of water into the dam reservoirs from the start of autumn. Iran is located in an arid zone and the country has faced a serious water shortage crisis over the past several years. The government has taken some measures to get out of the current ecological situation however it has been unable to address the problem so far. Many experts believe that the current water shortage problem is a result of water resources mismanagement, rather than drought itself. They believe that proper management of water supplies is what Iran needs to end its water crisis. Experts have said an efficient mechanism is required to reduce the consumption of water resources in the agricultural sector - which stands at about 90 percent of the total water supply, and instead allocate a larger share to residential and even industrial sectors. The government has plans to diminish water consumption in the agriculture sector from 92 percent to 87 percent in view of helping improve water supplies in cities and villages. But this requires a wide scale overhaul of the country's irrigation system in addition to publicity. Iran's total annual water consumption is approximately 93 billion cubic meters, out of which about 92 percent is used in agriculture (86 billion cubic meters), 6.6 percent in municipality (6.18 billion cubic meters), and 1.2 percent in industry (1.12 billion cubic meters), according to the United Nations Food and Agriculture Organization. Up to 70 percent of water used in the agriculture sector is being wasted, Iranian officials say.